This woman seriously owned her cheating partner with the perfect revenge plan after finding out he’d been unfaithful. 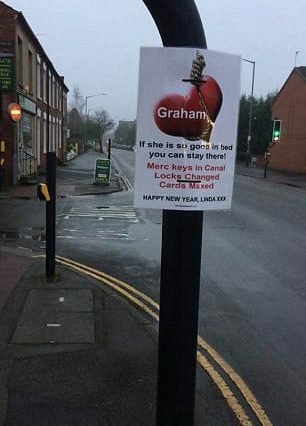 Linda from Warwick unleashed all kinds of hell on ‘Graham,’ when she plastered the town with posters letting him – and everyone else – know loud and clear he’d been well and truly dumped. 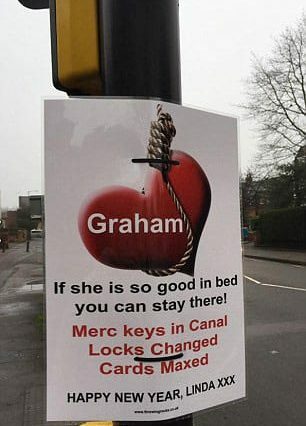 The hilariously brilliant posters show a heart, in a kind of creepy noose, with her ex-partner’s name emblazoned across the front, along with a cutting caption, the Daily Mail reports. 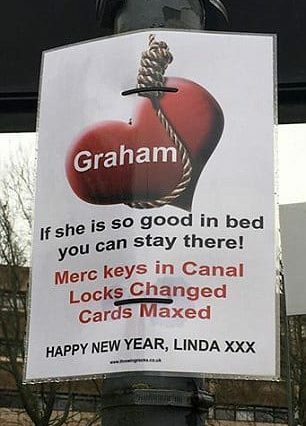 Graham, if she is so good in bed you can stay there. 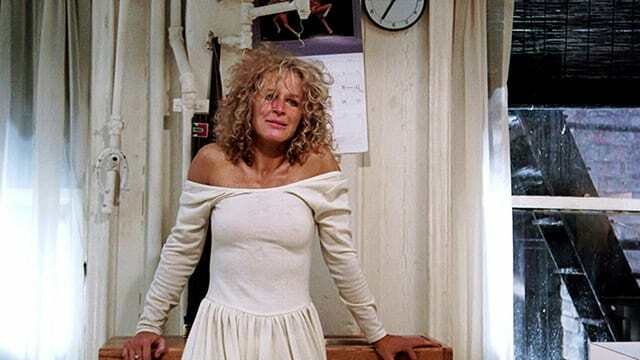 Not content with that, she used the posters to tell her estranged partner she’d also changed the locks and maxed out his credit cards. She then ended the post in style by wishing him a ‘Happy New Year’ along with three kisses. 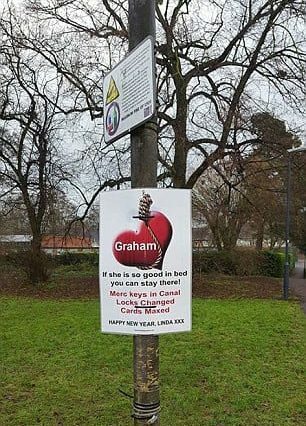 At the moment, no-one knows who Linda and Graham are, but there have been loads of sightings of the ingenius poster spotted about the town, which users were quick to post on social media. The brutal posters were tied to lampposts, traffic lights and road signs across the small town. People who stumbled upon them shared their images with scathing captions, shaming Graham for his actions. Don’t think Graham in Warwick will be having a very good day. Posters all over Warwick . Naughty Graham. I think it’s fair to say that Graham, whoever he may be, is well and truly in the dog house.